Laughing Fridge Art Magnets: Edgar Allen Pug is Having a Giveaway! Edgar Allen Pug is Having a Giveaway! 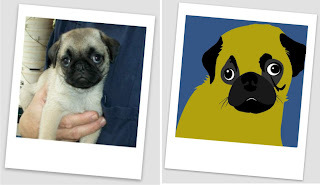 I recently met a wonderful Etsy graphic artist who creates inspirational dog art prints. Her name is Ginger and her shop is goingplaces2. She posted a message on my Dachshund Team forum looking for a good head shot of a dachshund to use for a pocket mirror. Although I own two dachshunds I didn't have any good mug shots. I asked her if she could use a pug shot instead, and luckily that was also a dog she wanted. I sent her one of Eddie's puppy pictures and lo and behold, Edgar Allen Pug became immortalized! And it came in nice little cloth bag so I can keep it from getting scratched while carrying it in my purse. Eddie just loves his pocket mirror and wants to give away another one just like it. He's going to make it easy for everyone to enter, too! You get two ways to enter, but only one is required. Enter twice to increase your chance of winning. Each eligible comment will be numbered and the winner will be picked using random.org. BE SURE TO LEAVE YOUR EMAIL ADDRESS IN EACH COMMENT SO EDDIE CAN FIND YOU IF YOU WIN! 1. Visit goingplaces2 's Etsy shop and leave a comment here telling Eddie which item is your favorite. 2. Leave a comment telling Eddie how adorable he is and why you want to win this pocket mirror. That's it! Contest ends on 5/15/2011 at 9:00 PM Eastern Daylight Time. Winner will be notified by email to get your mailing address. If Eddie doesn't hear from the winner within 3 days, another winner will be chosen (he's an impatient pug). Me went to the goingplaces2 Etsy shop! Wow she has such cool stuff! Me looked at all the doggie and elepant and cat pictures, but me thinks me likes EDDIE the bestest!That's cuz me thinks Pugs look sort of like siameses - except theys gots brown eyes and us Siameses has blue. And Eddie has such a cute little face! Me would love to rub against him!! I love her shop! My favorite is the Eddie mirror, but really her prints are too cute. Eddie you are so cute! Every time I see a picture of you, I want to get a pug. I know if I do get a pug, it will be adorable, but not as adorable as you. I want to win the mirror, so I can look at your cute face many times a day, no matter where I am at. I love eddie a lot and his cute little pug face brings a smile to my face! I hope I win so Ms kitty can snuggle with eddie and look at her eyes in his mirror. Eddie is so cute and I really love the look at the bottom...."looking for food"!! Adorable doggie! Eddie, I like this one best. http://www.etsy.com/listing/65129922/black-lab-art-print-inspirational-dog Looks most like the tall black lab mix we recently lost. I'm partial to black lab mixes! Very cute items. I like Eddie's mirror the best! But I would want one with Pepsi on it too! To keep Eddie company! Pepsi is a Min Pin! Hello Eddie!! I must say I am totally enamored by your awesome photogenic "pug mug"!! You are quite adorable and I would love to win your pocket mirror so I could see your cute little face every day! Hopefully, I will be the lucky one picked at random. I promise I will share it with my cat that also has the "cool" name of Eddie! He is a poser from way back so I know he will love looking at his cute little mug too! Posting this comment for Gail who is blog disadvantaged and couldn't figure it out, lol. She left a nice comment on Facebook though. Thanks for commenting on my blog, I just love meeting new friends! You are the most adorable pup ever Eddie! I meant it! :) I would love to have this pocket mirror to make everyone else jealous at how cute it is. :D Unfortunately, my favorite item in the shop has kitties on it since I'm such a sap for cats (sorry Eddie!!) It's this item here : http://www.etsy.com/listing/66492765/cat-love-kitty-cat-print-series . You are an excellent model! I visited goingplaced2 and aside from your most charming mirror, I saw several things that would be nice to have, but, I have a friend who had to help his pug Mickey to the bridge the day before Mother's day. His Mom went to the bridge in October, so it was Mother's day without his mom or his best friend. He is very sad right now and I think - since you look so much like Mickey - a picture of you on a mirror would cheer him up. A lot. Lots of great dog prints - it was hard to pick one. My favorite is this one with a black and yellow lab (they look just like our Labradoodles) with a sweet saying. Eddie is too cute! My teen daughter loves dogs and would like to admire Eddie's mirror. Eddie, you are absolutely adorable and you look just like my pug! You two could actually be twins! I would love the mirror to carry in my purse to remind me of how cute pugs are! My favorite print at goingplaces2 has to be the Pug Dog Art Print Inspirational Dog Art Print Series found below.